Last Christmas the husband my dearest friend April Asked me to knit his lovely wife a stocking. I of course said yes. Well, to make a long story short, his request came a week before Christmas and I was not able to knit it up in time for last years festivities. I am happy to say that I did complete it in time for this holiday season. Dear sweet April requested something in an icy blue with white accents. She requested no Santa heads, Christmas trees, or Reindeer! So I thought icicles. Why not? It kept with the Icy blue theme. I hope she is happy with the end result. I knit the entire thing in the round and stranded the icicles. The yarn was not the best to knit with as I used Red Heart yarn. I always use cheap acrylic for Christmas stockings as it stretches for days and will last for several centuries. No Christmas stocking would be complete without the requisite jingle bells so I added as many as I had on hand. Hey, Christmas decorations are supposed to be tacky! I am of the opinion that Christmas and large weddings are supposed to be tacky. There is no such thing as a "big" tasteful wedding. This opinion was formed early in my youth after attending many big Polish weddings in Michigan. When I was growing up it was not uncommon for a wedding reception to be attended by five or six hundred people, replete with a live polka band and a DJ (they took turns). I also grew up not fifteen miles from Bronners, the worlds largest Christmas store! Oh this place has to be seen to be believed! It brings new meaning to the phrase over the top.....I love it. I visit Bronners every time I visit home. So this is what I have been knitting the last couple of days.......Waiting.......and waiting......as often I am....for the plumber who is not going to show. It ticks me off. I could have gone into the city on this gloriously cold and sunny day and just walked around and visited a couple of museums or something. Oh well, life goes on. In the grand scheme of things this is a drop in the bucket. I just wish they would call to let me know if they are not going to be working. Ahh, what a nice way to spend an afternoon. I knit Mare's Silky-mouse! It was a blast. My mousie is not so silky as I knit it in Kureyon instead of the Silk Garden called for in the pattern. I have some Silk Garden in the stash and will use it next time as the Kureyon was a bit sticky on the bamboo needles. I also knit very tightly so that may have added to the stickiness. All in all this is an excellent pattern, well written, and a fun and quick knit. The braided cable down the little mouse back is to die for! I love cables....I needed something fun today as the contractors did not show up for work.....AGAIN......needless to say, I made a couple of calls and am waiting a response. Fun Fun Fun! Microwave Thanksgiving dinner anyone? Yum Yum! The kitchen is toast, so to speak, pun intended. We are having our kitchen gutted this week with subsequent remodel to follow. The first time I saw this kitchen I almost cried. It was that bad. Period. Words can not describe the hideousness of the....well...everything. The floors were nasty peel and stick tiles stuck on some kind of wood one step above cardboard. Said cardboard was stapled to one layer of vinyl flooring. The vinyl was glued to a layer of Forest green linoleum tiles. These green tiles were covering a yellow and white checkerboard pattern of linoleum tiles. The walls were covered by a nasty type of paneling that can only be described as having a pattern like grandmothers curtains.....A faux brocade green tile paneling, it was magnificent in it's hideousness. The counters were a lovely white flecked Formica, tinged yellow with age. The cabinets were solid wood and custom made.......IN 1950!.......oh yes, the contractors assured me they were solid. Poor guys. this is what I was left with on Tuesday. A nice new sub-floor........I had questions.......Aren't you going to close off this doorway and open this wall BEFORE you lay the tile......didn't the contract call for a total gut to the studs........AHEM.........it did.....wonder that! Then the contractors did not show for work on Wednesday! Who knew? Who could know? I was waiting patiently all day...........Waiting, as often I am............NOTHING.............no call......so, I went to the Library, I needed to be near my people. Not that I know them, or that they know me. I have spent the better part of the last fifteen years of my life and career in libraries and I needed to get out of the @#$%ing house! Well, This morning, Thursday, one of the guys arrived at 7:00 am, and asked me if we were all on the same page. I said "HUH? ".......Evidently the guys raised questions with the project manager and they were informed that this was supposed to be a GUT TO THE STUDS! .....NO KIDDING..... I told them before that was what was in the contract. They didn't listen, or they listened enough to ask the PM more about the job. Well, everything took care of itself and I did not have to call anyone and complain. So this is what I have going on as I type. A nice kitchen gut to the studs, just like we ordered. All is well that ends well i guess. The picture is not blurry, that is just plaster dust hanging in the air, of which I am allergic. I almost laughed in the guys face when he told me the cabinets would be hung by Friday, HAHAHAHAHAHAHAHA, I just had to add that as sometimes my own laughter is just not enough. I will say one thing bout the contractors. These guys work hard. They don't even stop for a lunch break. From 7:00am till they leave it is contant activity. They work hard for their money and they deserve every penny of it. I ordered some yarn from Peace Fleece Last Tuesday and it arrived Friday! Fast service, faster than they usually are. I was excited none the less. So there you have it, the whole haul. Thirty five skeins of the stuff. I will be busy for the next month or so. There is nothing like moving to a different part of the country with a colder climate than you have been used to for the past twenty years or so to get you to knit sweaters. And sweaters it will be. On the left side of the picture are ten skeins of Grass Roots, in the middle are ten skeins of Ancient Fern , On the right are ten skeins of Tundra, and the bag holds a kit and pattern for the Simple Pie Vest in Siberian Midnight. I will be happily knitting my Peace Fleece for a while to come. I did cast on for "Hugh" from the Rowan book A Season's Tale yesterday afternoon with the Ancient Fern. More on that later this week. I can not tell you how much I like this stuff. It is a bit firm to knit with but the knitted fabric totally transforms after a warm bath, almost as if it were another yarn. I think the warm bath helps the mohair content "bloom"! I noticed TypePad has changed yet again. I never read their updates or e-mails but TypePad is so intuitive and easy to use I never really have to use their help to figure out how to use new features. Are there any other TypePad knit bloggers out there who also like the new layout and blogging / posting features as much as I do? I especially like the edit html tab next to the compose post tab. I also noticed this morning that a photo shows up in the compose post window as opposed to just the html code. Yes, James has come undone. I was just not happy with this sweater. The knitted fabric on the body was much more stiff than the fabric on the arms. The arm fabirc draped much more due to the inclusion of the non Kureyon yarn. I suppose I could have just knitted the arms in a different contrast yarn but the love for this sweater was just not there. I do love working with Kureyon though. I think this sweater would be nice done in Silk Garden as I think it would have more drape to the knitted fabric. I did learn how to seam a sweater. This was the first adult sweater I have knit flat, in pieces. I feel liberated. 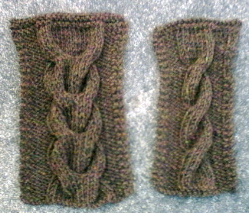 I have been swatching for "Hugh" from the Rowan book A Season's Tale. Here are my swatches done in Peace Fleece in the color Ancient Fern. I have a huge order from Peace Fleece on the way. I love working with Peace Fleece and the knitted fabric is heaven after a nice warm bath.